Italy is certainly one of the most attractive vacation countries, rich in history, culture, natural beauties and many tourist features. 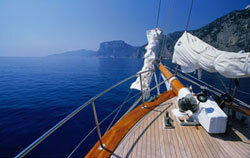 It's a place for everyone offering a variety of choices and unforgettable adventure of exploring the Italian riviera. Long coast line and many islands will give you plenty interresting places to visit and make your cruise unforgetable. ELBA – the biggest island of the Tuscan archipelago, providing shelter for those seeking for beautiful sandy beaches, clear sea, tranquillity, marvellous Mediterranean vegetation. Portoferraio is its main port available for cruisers. Since it is always crowded it accepts usually small boats. Porto Azzurro is one of the most interesting places with a deep bay providing anchorages at the pontoons. Then Marciana Marina which is an ideal starting point towards Corsica, a trendy place with bars, discoteques and restaurants. CAPRAIA – is of volcanic origin, rich in vegetation with only one small harbour for anchorage. It's an ideal place for walking fans, for once you come to the Mount Penne, you can see almost the entire island. CORSICA – a cruiser's paradise indeed with a variety of landscapes, white beaches and crystal sea, granite peaks, ports providing all the facilities and usually crowded during the summer season. SARDINIA – island of diversity due to different cultures and colonization in the past. Northern part abounds in beaches and bays, natural attractions and the group of splendid island of the Archipelago La Maddalena famous for different forms of granite, wild nature small beaches and sandy landscape. This area is exposed to strong winds and the best shelter would be Cala Francese to the south. GIANNUTRI – called the island of the seagulls, it's a place of unspoiled nauture with cliffs surrounding the island. MONTECRISTO – rather unaccesible but really beautiful island where landing is not permitted unless you own a special permission. MONTE ARGENTARIO – an appealing destination with splendid beaches and underwater attractions for scuba divers, one of the most beautiful tourist resorts in Tuscany. Porto Santo Stefano, on the north, Porto Ercole on the east and the Marina of Cala Galera are three major ports that can harbour boats providing all the facilities for yachting. PONTINE ISLANDS – are easy to reach from the coast of the region Lazio. There are 6 islands of volcanic orgin and exceptional beauty. The port of Ponza provides anchorages fon pontoons equipped with water and electricity. Palmarola then, with its cliff vertical to the sea and bays with small restaurants. Another island of this group Ventotene with the old harbour Porto Nicola. There is the new port as well offering various services for visitors. Finally, Santo Stefano with the prison citadel and several places to land. ISCHIA – famous tourist destination known for its thermal springs, mild climate and rich vegetation. It's a place of uncomparable beauty. CAPRI – with high and irregular coast providing a spectacular view. Marina Grande is the only port on the island. However, there are several other anchorages. The island is home to endemic specie of blue lizard. It is the place of mild and humid climate. EOLIAN ARCHIPELAGO – formed of seven island of volcanic origin. Lipari is the largest, with three ports and many anchorages; Marina Lunga, Sponda di Vinci and Canneto. Salina then, with two small harbours. Panarea surrounded with small islands. Stromboli, the only volcano in the world with constant activity. Vulcano, formed by 4 volcanoes with spectacular coast. Finally, Filicudi and Alicudi, two splendid islands of this group. EGADI AND PELAGIE ISLANDS - are an archipelago of 3 islands west of Sicily: Favignana, Levanzo and Marettimo, all with many bays and coves protected from all winds. The archipelago of the Pelagian Islands is situated south of Sicily; Lampedusa, Linosa and Lampione.